Developer / company: GrandSoft Ltd. Looking for an alternative to view ACCDB, MDB, ACCDE and MDE database files? There are a lot of viewers out there but only a few that you can really count on. ACCDB MDB Explorer is one of them. 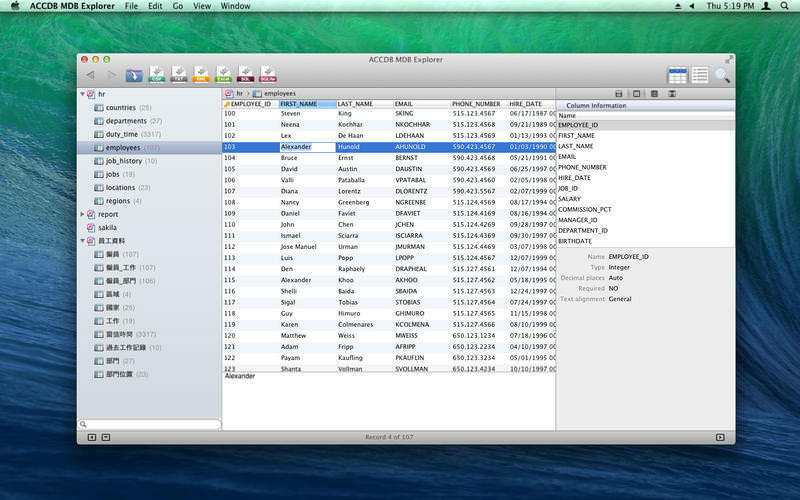 ACCDB MDB Explorer is a tool designed to provide a quick and easy way to view ACCDB, MDB, ACCDE and MDE database files without an Access license. This application can be used to open tables from multiple access databases, having table structure described in term of column, index and relation. Using ACCDB MDB Explorer, you can effortlessly export data into the most popular formats including CSV, TXT, XML, XLS and XLSX. In addition, you can generate SQL file that is compatible with popular database systems like MySQL, PostgreSQL, Oracle, SQlite and SQL Server. If you need more information please contact the developers of ACCDB MDB Explorer (GrandSoft Ltd.), or check out their product website.